Franco Pellizotti has been handed a two-year suspension after the Court for Arbitration in Sport (CAS) has upheld an appeal from the International Cycling Union (UCI), according to la Gazzetta dello Sport. 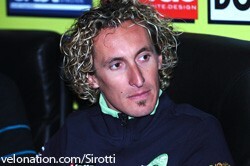 The Italian, who was riding for Liquigas before he was withdrawn from competition last May, was hoping to be cleared and to ride in this week’s Tirreno-Adriatico, but instead will have to sit on the sidelines for at least another year. Pellizotti has been suspended under the UCI’s Biological Passport system, which monitors parameters in rider’s blood profile in order to spot the signs of manipulation and doping. The system has come under fire recently as some national agencies have been reluctant to sanction riders over what is not a specific positive doping test. The UCI will likely see the decision as a vindication of the system, and Slovenian rider Tadej Valjevic will be even more anxious as his own, similar case is due to be heard soon. On May 3rd of last year, just day’s before the Giro d’Italia, the UCI asked the Italian Olympic Committee (CONI) to open an anti-doping investigation into Pellizotti’s blood parameters; some of which dated back to the previous year’s Tour de France, where he won the polka-dot mountains jersey. CONI originally recommended a two-year ban, but this was reversed by the Italian National Anti-Doping Tribunal (TNA) on October 21st. The UCI subsequently appealed the TNA decision to CAS, and the appeal has been upheld. Had Pellizotti escaped penalty he would likely have signed for the Spanish Movistar team, which has been without a Grand Tour leader since the suspension of Alejandro Valverde. Moe worrying for the UCI though, the entire Biological Passport system would have been called into question as an effective and reliable anti-doping tool. The start of Pellizotti’s ban will likely be backdated to May 3rd 2010, when he was first removed from competition, meaning that his suspension should last until May 2nd 2012.